Everybody knows the term homeopathy, but only a few can really explain what it is all about. Let’s take the principle of vaccination: The body’s immune system gets trained to fight successfully infectious diseases by getting into contact with the tiny amount of the same bacteria , that would bring about the contagious disease. For example pox. Homeopathy works similar. Substances, that would be harmful in their original strength are diluted. That can be herbal, mineral or animal substances. Samuel Hahnemann, the inventor of homeopathy, found out, that the higher the dilution, the higher the efficiency of the used drug. His way of diluting went in so called 10 grade steps. This means 1 part of the original substance was mixed and well shaken with 10 parts of water, alcohol or rubbed with lactose sugar. This results in X-potencies. (X is the Latin abbreviation for ten)There is another method available that takes 1 to 100 parts. Then we talk about C-potencies (in Latin C stands for one-hundred). The (exponential) grades are counted like in math. X1 means 10 to the power of (-1) which is one tenth or X6 which is 10to the power of (-6) which is one millionth. This means the number behind the X is counting the zeros below the fraction line. The dilution where the scientists begin to feel funny is X 27, as this is known as the “Loschmidt number” saying that beyond this dilution there is no substance of the original found any more. But this is just the beginning of homeopathic dilutions. The higher the dilution the more profound the effect. I mainly work with the X200 and see good results. 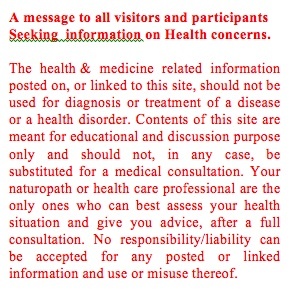 Working with homeopathy, means not to find a diagnosis, but to find the adequate remedy picture. The homeopathic remedy has to fit like key and keyhole. If it does not fit, it is not working. Samuel Hahnemann worked with the principle, that substances, that would bring about certain symptoms in healthy people, would help as a remedy against the same symptoms in sick people. Here one example: Belladonna in its original substance is a poison. Belladonna remedy picture is: red face, sweat, delirium, excitement, wide pupils. If someone shows one or more of these symptoms during a fever without having taken Belladonna as a substance, then Belladonna is the right homeopathic remedy to take. With most homeopathic remedies healing occurs by bringing the symptoms to a healing crisis, where everything gets worse for a short time and changes then for the better. But after that the disease has healed out completely. That is the main difference to allopathic medicine. Allopathic medicine is an antidote, a remedy against something. Homeopathy helps for something, it goes with something. That is also why sometimes homeopathic remedies seem to fail. If the remedy picture does not fit , the remedy won’t work. For example a little boy wakes up at night with sudden tearing ear aches. He does not want to get touched and cries aloud. The boy’s head feels hot and one cheek is red the other white. He despises all kinds of noise, even music. The remedy picture of these symptoms goes with Chamomilla. 5 pellets of Chamomilla X30 might cure this spell within half an hour. Assume his best friends comes down with an ear ache the same night. But his ear ache is not tearing but sharp, stinging. His throat aches as well. His faces turns from red to white and fever is low. This calls for Ferrum phos X 6 as the right remedy. Children, that are prone to frequent ear infections might well respond to a once given dose of Calcium carbonicum Hahnemanni X 200. The higher potency is for the more chronic nature of the process. The more acute the disease, we lower the dilution. The pharmaceutical industry in Germany has a long tradition of developing complex homeopathic remedies. They have proven to be effective even when they are given in accordance to the diagnosis instead of the remedy picture. But the above said also explains why these complex remedies sometimes fail. is a potency, that, I was told by an old Naturopth many years ago, had the best of all homeopathy. So I found some of the substance really helpful and will list them here. This is not to talk anybody out of a doctors treatment. I just give my own experience that I gathered in decades of using these homeopathic substances. When you try these remedies, you do this at your own risk. drops. Take hourly 10 drps at an acute spell of herpes and once the crust is gone, take it as a precaution for 1 month 3 times a day 20 drops. After some treatments you may experience that the herpes spells subside and come less often or disappear. An illness of the body is always an illness of the cell. In order to treat the body he would find the right remedy picture and give detailed orders of how to take them. He distinguishes as all homeopaths do, between acute and chronic illnesses:. In the US Schuessler Cell Salt number 8 (Magnesium phosphoricum X6) , 10 tablets diluted in a drink of hot water are proven for any kinds of stomach and intestinal cramps. "Chronic high acid levels in the cells "
with this condition Schuessler Cell Salts Natrium sulfuricum, Natrium muriaticum, Natrium phosphoricum are taken as 10 tablets each in a glass of hot or cold water once a day for at least one week. In that time the patient should refrain from all animal products. .. is the remedy for the weak connective tissue. All organs seem to sag down, posture is bad, teeth also. Coming with the sagging are diseases like varicose veins, hemorrhoids, flat feet - just to name some. I read in some books, that wrinkles could be prevented with 1 tablet a day. As you may see from the symptoms, most of them are not acute, that’s why they are taken only once a day 1 tablet. Iron phosphate pictures also a pale complexion, but it more the "Snoewhite type" - pale skin, blue eye-shadows (or brownish on eye-shadows on dark haired persons) , they perspire and get cold very easily, they are prone to cirucaltion disorders and rheumatic diseases. They love to drink lots of - preferrably cold - water and do not at all like meat or milk. Women of the Iron phosphate type suffer from menstruation disorders (too early and too heavy menstruation bleeding) Usually conventional medicine substitutes then Iron as tablets. Sometimes that's not tolerated well and leads to bad diarrheas. With Iron phosphate X6 or eventually X12 these conditions (low blood count due too heavy menstruation bleeding) can be treated even better, as the Iron ions are better integrated within the cells, when the mineral is taken in a homeopathic dose. Iron phosphate is the first-to-try remedy on an acute spell of flu or throat ache. There one may take one tablet of X6 every minute. The same goes for injuries, especially when they are bleeding. In most cases the diseases that fit for Iron phosphate are very acute and often serious. Therefore it is also important to see a health professional if such health problems occur. Potassium chloride is the best sinus remedy. Its used for the stuffy nose, and also for hearing problems when the ears are internally swollen. All mucosa is very sensitive, the tongue is covered with a whitish gray layer, the intestines are prone to diarrhea. Cold beverages are not well tolerated. The typical Potassium chloride type is rather chubby. Potassium chloride is also the best remedy when inflammations are past the acute stage. Potassium chloride can be tried (as well as Thuja) as a remedy for unwanted side-effects after vaccination. Hearing problems with or without history of vaccinations also correspond well. Potassium sulphate is the remedy when the inflammation has reached its suppuration stage and becomes puss. One may say that is the last stage before an inflammation becomes chronic.. Rattling slimey noise in the lungs with no real cold calls for this remedy. Potassium sulphate works well for nerves and joints. The type who needs it, is sad and fearful, suffers often from neuralgic pain in the face, wakes up at night and has palpitation. Whose skin itches, when the bed gets warm, who suffers from rheumatic diseases - they all could try this remedy. Magnesium phosphate is famous as "The Hot Seven"
Magnesium phosphate is the painkiller of the cell salts. In conjuction with Schuessler Cell Salt 9 and 10 it makes a great drink to eliminate uric acid fast. Sodium chloride can be taken against high blood pressure and also against migraine headaches that relate to malnourished blood vessels in the brain. Pale anemic rheumatic disease plagued people should take Nat mur reagularly to eliminate the acids. The typus for Nat mur is pale, has a cold nose tip, tends to lean on any support, has pounding morning headaches, tends to love any kind of hearty meals, hunger spells and fast saturation are common for this typus as well. Also some tendency to get a diarrhea easily. As every homeopathic remedy, Nat mur works for animals too. I gave my dog, Sally, when she had a diarrhea, that could not be stopped with the vets treatment, daily doses of nat mur for a month. Then she was ok. The slender manager with chronic acid stomach problems needs Sodium phosphate X12, as this relates to a chronic condition. The face is often pale, yellowish, lymphatic glands are swollen. There is a tendency to develop rheumatic diseases and gout. In general one may say, that person reacts easily to be "sour"
Is the remedy to treat puss and bad odors. The constituion of the typus needing Silicea is described as hollow faced, with weak connective tissue and grey white teint. This person is overreacting on all kinds of disturbances, whining, resenting meat, having sweaty hands, nail diseases, athlets feet, .... all these are symptoms that may want Silicea as a remedy. Precaution during pregnancy: To avoid any lack of minerals, pregnant women should take throughout the pregnancy 1 tablet a day of Calcium phos and Calc fluor X 6. Once a week a drink with 3 of all 11 cell salts helps mother and child to stay healthy and to utilize all the minerals, that come with the food digested. In the US there is a remedy (Bioplasma made by Hyland) available that contains all Schüssler cell salts in one tablet.